The Celebrating Path of Enlightenment celebrated the Birthday of our beloved Sadhguru Parama Poojya, Jaimahavibhoshri. On the eve of Jaimahavibhoshri's Birthday, the organisation conducted various social activities. Free Medical Camp was conducted on December 3rd at Vampuguda Community Hall from 9.00am to 1.00pm. Sri. Patti Kumar inaugurated the medical camp. Dr Advaita, Oncologist and Dr Kaivalya, Ayurvedic Specialist diagnosed the patients and addressed their ailments. After the completion of the camp, organisers told that it was a pleasure serving more than 500 patients. With the Blessings of the beloved Master Jaimahavibhoshri, Aumaujaya Oorjeeshaa Nilayam (AON), Mumbai has distributed food packets to everyone on the occasion of Maharashtra Day and May Day. The event started at 06:15 pm and ended at 8:30 pm. Food packets were served at Aumaujaya Oorjeeshaa Nilayam (AON), Gorai 1, Borivali West, Mumbai. The food was served to all age groups; nearly 200 food packets were distributed. Many people also attended the pooja which was performed at the centre. All the Bhaktomaujaya's actively participated in the event and made it a grand success. 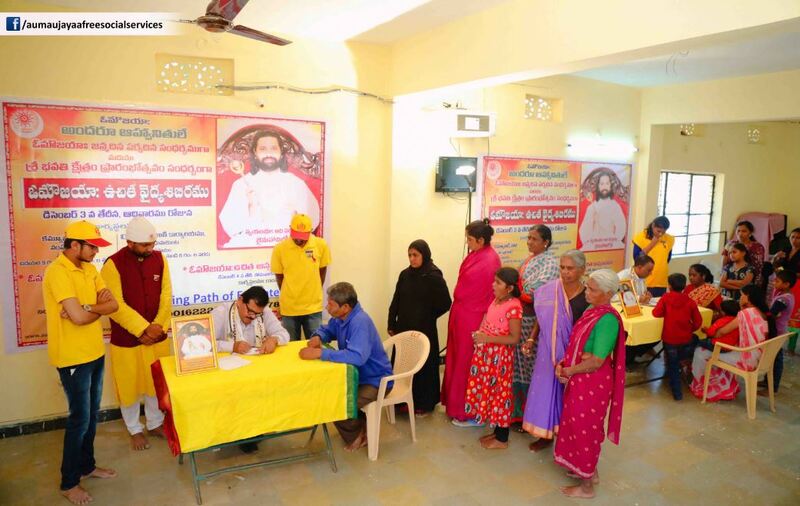 The organisation conducts such social welfare activities throughout the year on different occasion under the supervision of our beloved Master Jaimahavibhoshri. Bhaktomaujayas who served for this noble cause told that participating in such activities gives then a great satisfaction and happiness. They also involved their children in food packets distribution who served with great joy and with celebrating mood. Just do service and see, the goodness will strengthen within you.Just donate for good cause and see, the humanity will strength within you.Just attend the Sadguru's Divine Satsang and see, the divinity will increase within you.Just do Divine Campaign and see, the divinity will raise within you. By doing all these, you will slowly become one with Sadguru.All these activities are to unite you with the one which is beyond. No one in this world will allow us to go beyond them, only Sadguru will tries to enlighten you beyond him. These four sentences are really very miraculous. There are the only four ways to unite with Sadguru.